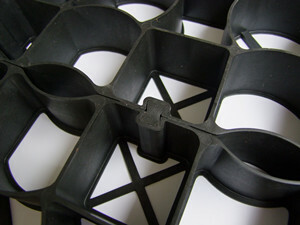 Plastic grid matting can provide a permanent separation of the base and top layers. Because it is installed in one-piece, the weight of the horse (or vehicle, etc.) is dispersed across the entire area. The grids are interlocking inseparable with special connective buckle, therefore there will be no movement of the fill layer. Due to the excellent drainage of ground reinforcement gravel grid, paddocks and Arenas will stay level and can be usable 365 days per year. Plastic grid matting can be used in small areas that have muddy problem like gate areas and paths to and from turn out paddocks in the same manner. In grass areas, grass is able to grow through the grids giving a uniform appearance and the roots will not be damaged because plastic floor grids can bear the weight of the horses. If using plastic floor grid system from Leiyuan Industrial Company Limited, run In Sheds can remain dry and high level. They can easily be cleaned out with a flat shovel or tractor blade. The problem of thrush from horses standing in wet run in sheds will be eliminated. HDPE flooring grid system surface provides excellent traction and there is much less ice buildup than on asphalt or concrete. The formation of black ice is practically impossible because the drainage is excellent. Flooring grid system will not cause a heat build up in warm climates like asphalt and concrete. What’s more, installing a grass driveway eliminates dust and noise. Grass paver grid eliminates digging, even for persistent dogs. This excellent system can greatly reduce wear paths in lawns. And Grass paver grid does not readily absorb cold and heat from the ground which making the kennel floor much more comfortable for your dog. The surface remains level for easy cleaning and the entire floor can be sprayed through.